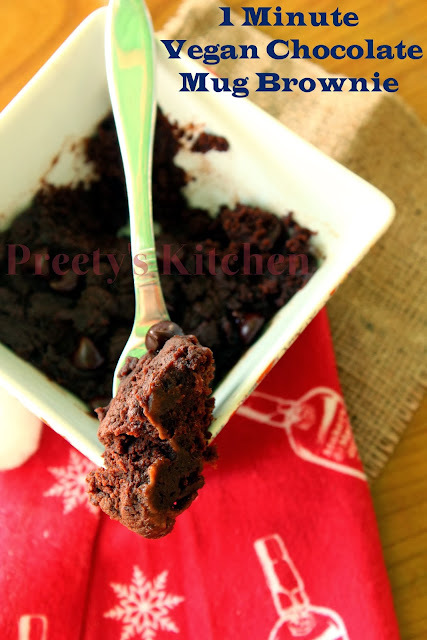 Satisfy that sudden brownie craving in mere minutes with this recipe prepared in a mug and a microwave oven.A denser, fudgier, more chocolatey version of the chocolate mug cake – a chocolate mug brownie.This really is more for those of you who prefer “fudgey” brownies to “cakey” ones. 1) Add the sugar, flour, cocoa, and salt to the mug and mix. 2) Then add the oil and Non Dairy Milk and mix the dry and wet ingredients together. Be sure to be thorough, there’s a tendency for clumps of the dry ingredients to form. 3)Stir in the chopped chocolate or nuts, if you’re using them. 4)Microwave on high for a minute, checking it after 30 seconds (microwaves vary) – it will be done when it’s springy on top but still a bit gooey in the center when done. 5)Let it cool, grab a spoon, and dig in straight from the mug.